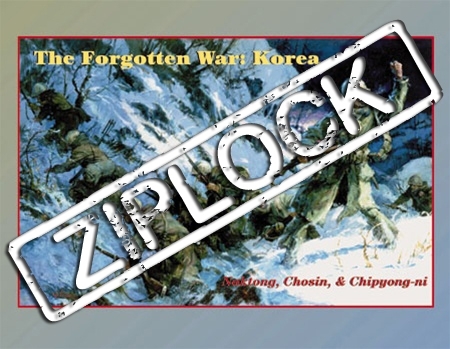 The Forgotten War includes three battle games of the Korean War. The scale is platoon level with rules for combat, close combat, air support, special weapons, logistic units, tanks and direct artillery fire. The Naktong Bulge: August 1950. Reeling from the punishment dished out by the veteran North Korean People's Army, United Nation forces desperately attempted a stand at the Pusan Perimeter. Only with great difficulty were the North Koreans halted and eventually driven back across the Naktong River. Chosin: November 1950. The hammer feel in the windswept mountains of North Korea as hordes of Communist Chinese troops hit the strung out 1st Marine Division. 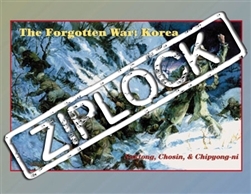 The game covers the entire battle from the Chosin Reservoir to the withdrawal across the airlifted Treadway Bridge on the road to the coast. Hedgehog at Chipyong-ni: February 1951. Retreating before yet another CCF offensive in this "yo-yo" war, it was decided to leave the well entrenched and reinforced 23rd Regimental Combat Team to hold the crucial crossroads at Chipyong-ni. Outnumbered six to one, the Americans and French clung to their positions and just managed to beat back the ill-coordinated CCF assaults, until finally relived several days later.